One of the best reasons to live in the south is definitely the weather, especially if you dread the cold. Last week, the highs were in the mid-70’s and this week it is in the mid-60’s with beautiful sunshine. Not bad for December! I’ll admit, even with perfect weather, it’s a little harder to get into the Christmas spirit with such warm temperatures. However, that didn’t stop us from pretending! Last week, we invited you over to our Red and Green Ornament Bridal Shower and today, you are cordially invited to our White Winter Wonderland themed baby shower. Sweet Savannah made her debut into the world this week, so we just barely snuck in a little bit of time to celebrate (pre-baby) with the mom-to-be. As a first time mom, there are so many needs. Although you never receive everything that you would like at a baby shower, every little thing is one less item you have to worry about when the baby gets here. A white winter wonderland shower is a great theme because it is easy and works for both girls and boys. If you have a mom-to-be that has decided against finding out the gender, this theme is for you! With Christmas around the corner, our tree was up and decorated and our mantle shined with pre-lit garland. We opted to take down our family’s stockings for the shower (too red for a white wonderland theme), but holiday usually any holiday decor is a good addition. This chalkboard sign was purchased for our wedding and it has been used over and over again. 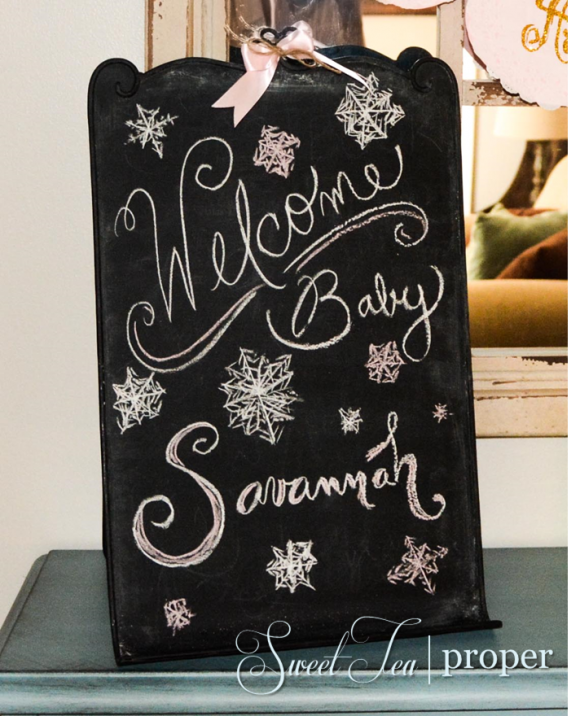 Whether welcoming guests, giving instructions, or displaying the food menu, a chalkboard sign is a fun addition to your party decor. The food was made available in the dining room. A white linen draped the table and the food was served in silver dishes. 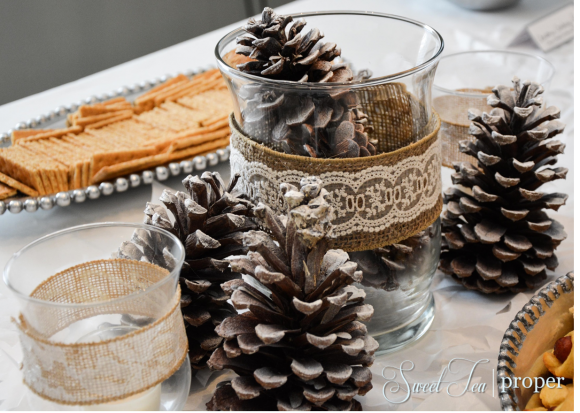 The centerpiece consisted of candles and pine cones lightly painted with white spray paint. 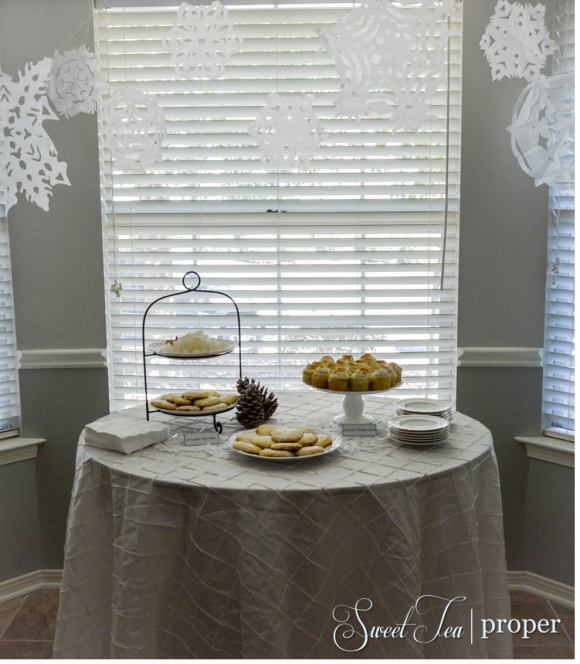 We connected white paper snowflakes for the table runner. 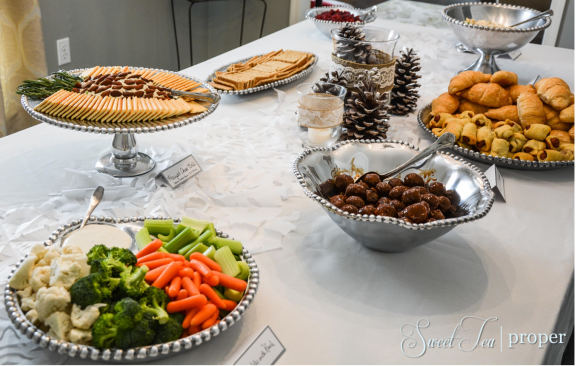 The white-painted “snowy” pine cones have quickly become my decoration of choice for winter parties. These are inexpensive (especially if you have a few pine trees in your yard), beautiful, rustic, and can be used throughout your home after the shower is over. 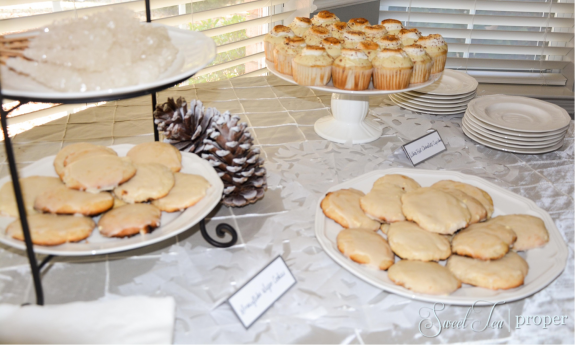 In lieu of a cake, we served white hot chocolate cupcakes topped with a toasted marshmallow, sugar cookies made by the guest of honor’s mother-in-law (she makes the best! ), and white rock candy. The table was draped with an ivory pintuck tablecloth and a variety of large and small white paper snowflakes hung from the ceiling. Since it was so warm outside, we opted against coffee, hot chocolate, or cider (although these are perfect beverage options if you live in a cooler area), and served a festive white sparkling punch and citrus water. As a new mother myself, there are few things more joyous than sharing such a special time with friends and family. We hope you enjoyed the party! 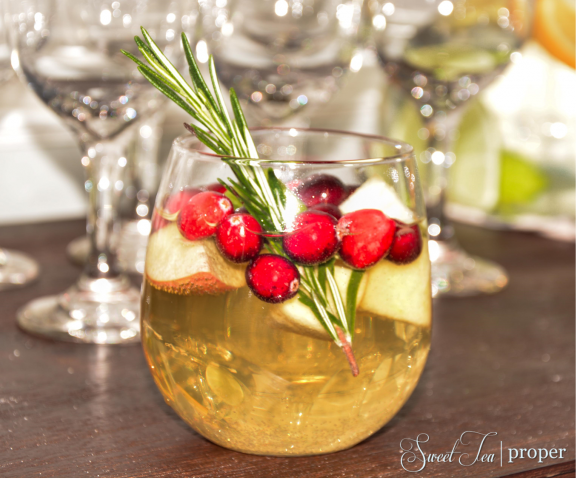 In our next posts, we’ll be sharing the recipe for the delicious cranberry dip as well as the white sparkling punch so stay tuned!